How Far is Navin's Aaradhana? Navin’s Aaradhana creates a wonderful world of residential ecstasy. Offering 3 BHK apartment located in Perungudi, it is well surrounded with shops, parks, hospitals, educational institutions and more that serve all the needs of your family. Located near the IT Expressway, it gives easy access to IT companies as well. Modern amenities like Gym, multi-purpose hall, power backup and security makes your daily life more comfortable. It is also provided with 3 Phase electricity connection, lifts and bore well water supply. Plus, the 2 covered car parking area gives convenience and safety to your valuable vehicles. Buying a beautiful home is everybody’s dream come true! Offered in the perfect location with all the required amenities, it would be the best buy for any buyer. Perungudi is an awesome location which is just 500 meters off the high-tech OMR. 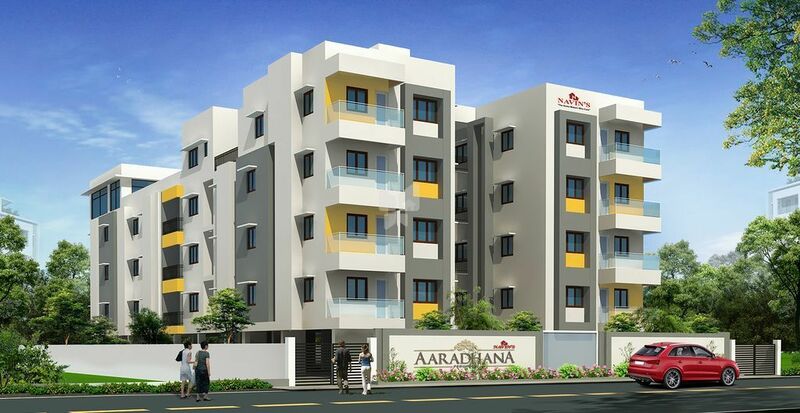 The Navin’s Aaradhana apartments are very spacious and provides ample ventilation. It sports Seismic zone III compliant RCC framed structure and concrete solid blocks. The main door of this apartment is made of Teak wood, while the bedroom doors and Toilet doors are made of high quality Timber frame. Kitchen is designed for daily cooking convenience. It features polished granite counter with stainless steel sink that adds style. All rooms are designed with Matt finish Vitrified tile flooring that enhances the look of the interiors. Book your home and enrich your living! .